Couscous is a North African dish of small steamed balls of semolina, usually served with a stew spooned on top. Couscous is a staple food throughout the North African cuisines of Morocco, Algeria, Tunisia, Mauritania and Libya and to a lesser extent in the Middle East and Trapani in Sicily. The origin of couscous is uncertain. Lucie Bolens affirms that Berbers were preparing couscous as early as 238 to 149 BC, describing primitive couscous pots found in tombs dating back to the reign of the Berber King Massinissa.Nevertheless, Charles Perry states that couscous originated between the end of the Zirid dynasty and the rise of the Almohadian dynasty between the eleventh and the thirteenth centuries. The remains of the first vessels ( known ) in the Tiaret region ( Algeria ) where cooking tools dating from the ninth century have been discovered, very strongly resemble the primary tool for cooking couscous. - Title from the Detroit Publishing Co., Catalogue F Scenic, Architectural and Marine Views, Detroit, Mich. : Detroit Photographic Co., 1899. 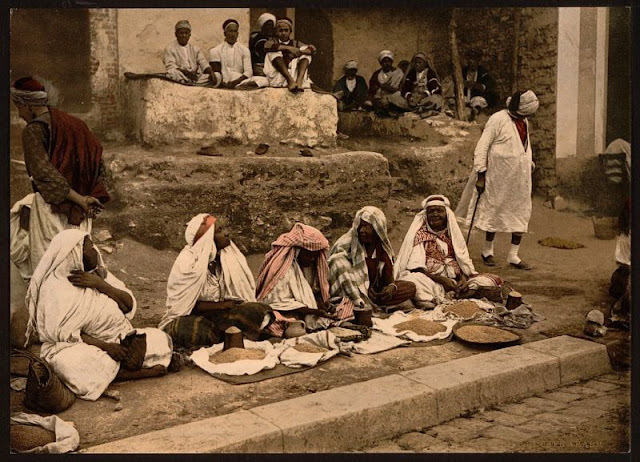 - Forms part of: Views of architecture and people in Tunisia in the Photochrom print collection.